Visiting one of the seven natural wonders of the world should be reason enough to choose this excursion. In addition to climbing to the top of Corcovado mountain and admiring the statue of Christ the Redeemer, though, the tour also takes us to another of the symbols of Rio, the Copacabana neighbourhood with its world-famous beach. We leave the port passing through the Laranjeiras residential neighbourhood to reach the Cosme Velho railway station, the shortest railway in the world measuring 3824 metres long inaugurated by Dom Pedro on October 9th, 1884. The train takes us to the top of Corcovado mountain, one of Rio de Janeiro's two peaks, famous in Brazil and all over the world for its statue of Christ the Redeemer and part of the Tijuca national park. The statue, the most important symbol of Rio, weighs 1145 tons, is made of stone and cement and is 30 metres high. It is located on an 8-metre-high pedestal on top of a mountain at 709 metres above-sea-level and offers breathtaking views. Lifts and escalators were installed in 2003 and, in 2007, the statue was proclaimed one of the New 7 Wonders of the World. 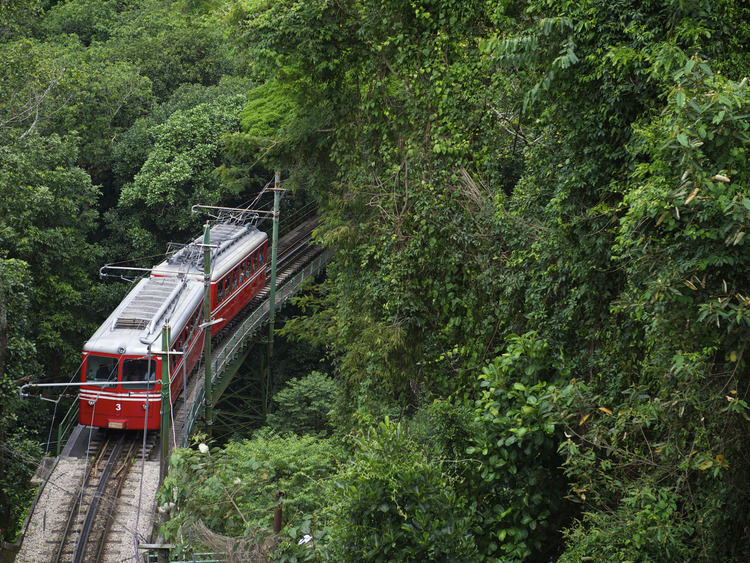 We take the train down through the Tijuca forest, where we can admire the fantastic vegetation of the largest urban natural reserve in the world. But our fantastic excursion is not over yet - a coach takes us to the Copacabana neighbourhood, located in the south of the city. It is considered one of the most famous in Brazil also thanks to its crescent-shaped beach, the so-called "Princesinha do Mar" (Little princess of the sea) mentioned in dozens of songs until the 1960s. During the weekend, the beach is filled with locals and visitors from all over the world, who use the neighbourhood's excellent transport system to come and take a dip or sunbathe. We may also have some free time to take a dip ourselves. Last but not least, the calçadão, the pavement whose mosaic creates amazing black and white waves, is perfect for a jog or a bike ride. The transfer to Corcovado mountain takes approximately 20 minutes. When busy, train waiting times may be longer. Should this be the case, the transfer may be carried out by coach. The panoramic view may be cancelled in the event of adverse weather conditions. Lifts and escalators are not active in the event of adverse weather conditions. The excursion does not include sun-loungers or beach umbrellas.